When you adopt a health conscious lifestyle, your dietary habits are likely to be one of the first and foremost areas where some changes will need to be made. If you have set a weight loss goal, there are sure to be some changes you’ll need to make in your current eating habits and food choices. One change may involve an increase in the frequency in which you find yourself cooking & baking at home. When you choose healthy ingredients and prepare food in a healthy manner, you’ll know that what you eat and what you feed your family is beneficial to everyone’s overall health. Beans rank high on the list of healthy foods. Cranberry beans, pinto beans, navy beans, white kidney beans, Mayocoba beans and Great Northern beans are often used in soups, stews, chili and baked beans. Black beans are a popular addition to many in Mexican dishes. Dark red kidney beans are a unique cold salad ingredient and are a complementary addition to rice dishes. Beans are easy to prepare and their versatility is impressive. While the precise nutritional values vary slightly with each specific type of bean, they all have similar health benefits. Beans support heart health and digestive health. They can assist with the management of diabetes. They can help lower cholesterol and reduce the risk of cancer. Beans are a good source of fiber, iron and B vitamins. Split peas and lentils offer the same benefits that beans offer. They also have one additional benefit that makes them an ideal healthy food choice for busy cooks. Unlike the previously mentioned beans, split peas and lentils do not require soaking. Split peas require about 45 minutes to an hour of cooking time. Green lentils will cook in approximately 30 to 45 minutes. Lentils are often used as a meat substitute. They are an excellent side dish and a delicious addition to soups. In addition to being used to make split pea soup, green split peas can be used to make dips and spreads for appetizers. Long grain brown rice has many health benefits to offer you. If a healthy eating lifestyle is your goal, this rice should be a pantry staple. It should appear regularly in your meal plans. Long grain brown rice is a low calorie, low fat, low sodium food that is also cholesterol-free. It’s high in fiber, loaded with antioxidants and rich in many of the minerals your body needs to function at its optimum level. It’s a versatile, budget-friendly food that fits ideally into a weight loss plan or a health-conscious diet. A lot of attention is being given to a group of foods referred to as “superfoods.” The foods that are included in this group are revered for their high nutritional value. Chia seeds and flax seeds fit into this distinctive category. 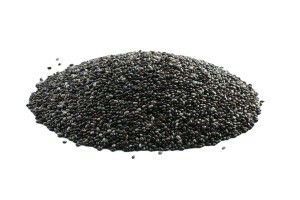 These seeds are rich in omeg-3 fatty acids. They are an excellent source of fiber and contain a high amount of the minerals your body needs. Chia seeds and flax seeds are a good source of antioxidants. These seeds can be incorporated into your diet in many ways. They are an excellent addition to a weight loss plan because they provide a feeling of fullness, thereby reducing your urge to snack or over-indulge. As more people transition to a health-conscious lifestyle, healthy recipes have become easier to find. Healthy foods, such as a diverse assortment of beans, beneficial seeds, lentils, and brown rice are readily available. Those two things combined make it possible for you to regularly prepare and serve your family healthy, nutritionally-rich meals that are full of flavor. If you have set a weight loss goal, those same foods can help you reach that goal while assuring that you get the proper nutrients you need to stay healthy.